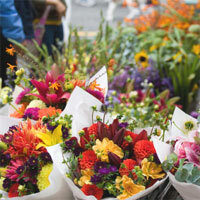 Flax Flower is a full, fresh, floral design house situated in beautiful Coolum Beach, Queensland. Their style has been described as having an abundant, unique, handpicked look and feel inspired by nature. While they enjoy challenging 'traditional floristry' the team at Flax Flower also maintain high respect for quality workmanship and design aspects. Beautiful bouquet sent to my daughter. Beautiful flowers which lasted for a really long time and my daughter was delighted thank you. My daughter was thrilled with the exquisite roses. She sent me a photo and they were even more beautiful than the picture on the website as some small ones had been added to the display making it even better. I always use Flax Flower and am absolutely delighted yet again thank you. Beautiful flowers again from Flax Flower. My daughter was delighted and said they were absoutely gorgeous. Thank you. I asked for something special for my daughter's 50th birthday and she was absolutely thrilled with the flowers she received. She said they were the most beautiful she had ever seen in the most exquisite colours. Thank you Flax Flower for making her birthday very special. I always use Flax Flower for bouquets for my daughter at Christmas and birthdays as they are so reliable and the arrangements are gorgeous. She was delighted with the flowers again this Christmas and I expect to be ordering soon for her special birthday. Thank you Flax Flower I wouldn't go anywhere else. My friend was very happy with flowers. She sent me a picture and I was pleased too..Very good delivery and will use you again thank you..
My daughter sent me a photo of the flowers. They were gorgeous and she was thrilled - everything was perfect and just what I wanted. I'll definitely be using Flax Flowers again - thank you. My daughter tells me that her flowers were hand delivered by Flax Flower in Coolum Beach on Christmas Eve and they were beautiful. She was delighted and I will definitely be sending her birthday flowers from this florist in January. Great service, Great product - high recommend - very happy!